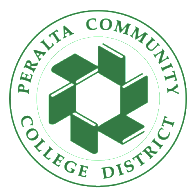 The Peralta Community College District Board of Trustees, at its annual organizational meeting held on December 9, 2014, elected a new slate of officers for 2015. Additionally, a newly elected trustee and two trustees, reelected in November, were sworn-in to serve for the next four years. Meredith Brown, who represents Area 2, was elected president and Dr. William “Bill” Riley, who represents Area 5, was elected vice president of the nine-member board, which includes two student trustees. Julina Bonilla, who was elected in November to represent Area 7, was sworn-in by Abel Guillén, the outgoing Area 7 Trustee who was elected to the Oakland City Council in November. Linda Handy, Area 3, and William “Bill” Riley, both re-elected in November’s election, were sworn-in, respectively, by former Assemblymember Sandré Swanson, who is Deputy Mayor of the City of Oakland, and Judge Gordon Baranco, Superior Court of California, County of Alameda. “We will continue to build partnerships with the local building trades, public transit agencies and the health industry, and we will work closely with our K-12 and county education partners to prepare our students for California’s changing economy,” said Brown. “We will continue to provide a well supported pathway for students transferring to our CSU and UC systems,” Brown Added. Brown, first elected to the Board of Trustees in 2012, is an attorney with over 20 years of experience in complex litigation and representing public agencies. She received her Bachelor of Science from Cornell University and her Juris Doctor Degree from Boston University School of Law. Brown served as a clerk for United States Magistrate Joyce London Alexander, First Circuit in Boston, Mass. Her community involvement includes service as a delegate to the 2008 Democratic National Convention, and leadership with the Alameda County Democratic Lawyers Club, Montclair Soccer Club, National Women Political Caucus – Alameda County North, and a volunteer Judge Pro Tem for Alameda County. Newly elected trustee Julina Bonilla is a community college graduate and received her B.A. from U. C. Berkeley. She is a former Oakland elementary teacher who moved into workforce development, providing education and job training to young adults in Northern California. Bonilla’s community work and active memberships include Board Vice President of Tradeswomen Inc., the National Women’s Political Caucus-AN, and she has served as a member of the Oakland Workforce Investment Board and co-chair of the Oakland Youth Council. She is the Program Director of the West Oakland Job Resource Center. Linda Handy, who was first elected in 2002, has a long resume of community service and college administration experience. She has a M.S. in Organizational Development and Analysis from the Weatherhead School of Management at Case Western Reserve University. Handy is a Laney College alumna and a former president of the Oakland Coalition of Congregations. William “Bill” Riley was first elected to the Board of Trustees in 1998 and is a Merritt College alumnus who has served in public education for over 30 years, including in the Oakland, East Palo Alto/Ravenswood and San Ramon School districts. He earned his Ed.D. in Educational Policy and a B.A. in Sociology and Physical Education from the University of San Francisco and an M.A. in Educational Administration from San Francisco State University. Continuing to serve on the board are Bill Withrow, who represents Area 1, Nicky González Yuen, Area 4, and Cy Gulassa of Area 6. Student trustees are Carl Oliver and Jeramy Rolley. For 50 years, the Peralta Community College District has served the cities of Alameda, Albany, Berkeley, Emeryville, Oakland and Piedmont by providing 30,000 students each semester with a range of educational programs and life-long learning opportunities. OAKLAND, Calif. (September 4, 2014) – Taking advantage of historically low interest rates, the Peralta Community College District announced this week its successful sale of over $157 million in bonds. By refunding its outstanding general obligation bonds, District leaders will save local taxpayers nearly $18 million over the 21-year life of the bonds. The District’s Board of Trustees expressed their approval of the successful bond sale, touting the District’s efforts to lower the local tax burden and apply strong fiscal oversight and management in order to maximize the community’s investment in the success of the District’s students. The District went to market with $157,725,000 in new bonds on August 20 to refund outstanding bonds approved by voters in 1992, 2000 and 2006 to enhance and modernize District facilities. The District utilized the services of Keygent LLC, Stifel, Nicolaus & Company, Inc., the lead underwriter, with Barclays Capital, Inc. and Raymond James & Associates, Inc. both acting as minor underwriters. The District’s administration, which spearheaded the Board’s direction to take advantage of favorable interest rates, noted the progress made in recent years to stabilize the District’s finances as the key to regaining the investor confidence necessary to refund the outstanding bonds and deliver local taxpayers substantial savings over the next 21 years. About Peralta Community College District: The Peralta Community College District provides educational leadership for the East Bay, delivering programs and services that sustainably enhance the region’s human, economic, environmental, and social development. The District is comprised of four campuses serving Northern Alameda County, including the College of Alameda, Berkeley City College, Laney College, and Merritt College. Through these four campuses, Peralta Community College District supplies the region with a trained workforce in essential fields such as nursing, automotive technology, office administration, mechanics, bio-manufacturing, bookkeeping, carpentry, food service and restaurant management, and many other fields. For more information, visit www.peralta.edu. In appreciation and recognition of Congresswoman Barbara Lee’s contributions to Merritt College and the Peralta Community College District, the Board of Trustees’ passed Resolution 14/15-05 at its July 15 meeting to name the Merritt Science and Allied Health Center the “Barbara Lee Science and Allied Health Center” in her honor. Trustee Linda Handy, in yellow, reads the Resolution to Saundra Andrews of Congresswoman Lee’s office, who is flanked by President of the Board, Abel Guillén. 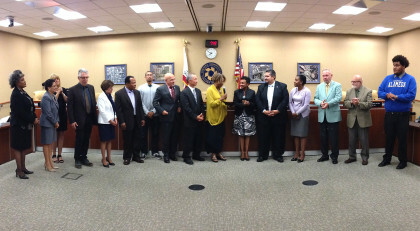 Members of the Board, as well as Chancellor Dr. José M. Ortiz, and other senior administrators, are also pictured. Please join me in welcoming State Chancellor Brice Harris (pictured) on Tuesday, July 1, 2014, from 10:00-11:00 a.m., in the District Office Atrium, 333 East 8th Street, Oakland, to celebrate the actual day of Peralta’s 50th Anniversary.The Peralta Community College District was founded on July 1, 1964, and we will be holding special Commemoration Day events to mark our golden anniversary. There will be a ceremony marking the occasion with the installation of a time capsule and a keynote address from State Chancellor Harris to memorialize this once-in-a-lifetime milestone. Remarks will also be made by Board of Trustees President Abel Guillén, mayors from our six cities, as well as other special guests.We will also be holding a reception after the festivities and food will be served. Students, faculty, staff and community members are all encouraged to join in the celebration as we mark the actual day of the founding 50 years ago of the Peralta Colleges. 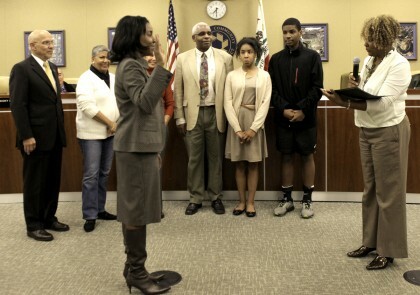 Two new student trustees were sworn-in last night at the Peralta Community College District Board of Trustees meeting. 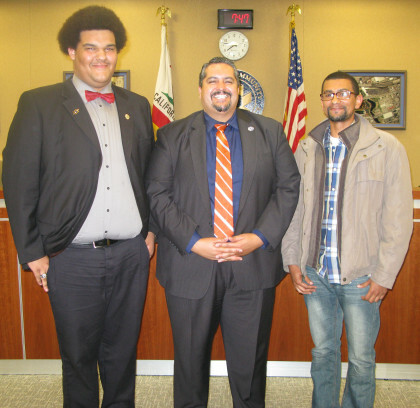 Board President Abel Guillén, center, administered the oath of office to Jeramy Rolley, left, who has been active in the College of Alameda (COA) community, and Carl Oliver, right, who has been active at Laney College. Both co-trustees represent all students from the four Peralta Colleges. Their terms end 5/31/2015. The Trustees of the Peralta Community College District extend our heartfelt congratulations to the graduates of Laney College, College of Alameda, Merritt College and Berkeley City College and thank you for your work and commitment to our students, faculty and staff who make up our diverse and dynamic educational community. We also congratulate the families and friends who support our graduates in their studies. As the time for commencement exercises approaches we reflect on the accomplishments of our graduates and ask you to join us in lifting them up and celebrating their success. The practice of the Peralta Community College District is for each college to plan its commencement ceremony through an internal committee process driven by the input of students, faculty, staff and administration of each individual college. We support the integrity of this process and ask that all of those attending commencement exercises respect the students and their families and friends, as well as the faculty and staff assembling in celebration of our graduates by honoring the students as the reason and focus of commencement. Nelson Mandela said education is the most powerful weapon, which you can use to change the world. Please join us in celebrating the educational achievement of our students as we recognize them for their hard work and demonstration of personal excellence. OAKLAND, Calif., January 31, 2014 – The Peralta Community College District Board of Trustees unanimously passed a resolution in 2013 to divest from fossil fuel companies in order to reduce carbon emissions and continue Peralta’s commitment to environmental sustainability. The resolution by the Trustees makes clear that Peralta’s environmental sustainability goals are critically important to the Peralta Community College District, the State of California and the nation. The resolution underscores how the District, which educates 30,000 students each semester, is committed to stewardship of the environment and to reducing Peralta’s dependence on non-renewable energy sources. “As Board President, I am proud that we have taken the lead on this vital issue and that we are doing something to help reduce these dangerous pollutants and to safeguard the future for our students, our community and our planet,” he added. The Peralta Community College District, following the Board’s leadership, has adopted progressive investment policies and committed itself to sustainable environmental and progressive social and corporate governance practices. In 2007, the Board adopted the District’s Policy on Environmental Sustainability that mandated dramatic reductions in its carbon footprint. “At our four colleges – Berkeley City College, College of Alameda, Laney College and Merritt College – we are working everyday to reduce our carbon footprint through an array of new technologies,” the Chancellor added. 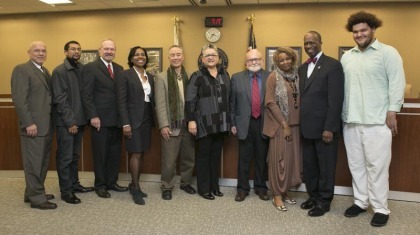 The Peralta Community College District’s Board of Trustees, at its annual organizational meeting held on December 11, 2012, elected new officers for 2013. A newly elected Trustee, Meredith Brown, and three reelected Trustees, Nicky González Yuen, Cy Gulassa and Bill Withrow, were also sworn-in to serve for the next four years. Cy Gulassa, representing Area 6, was elected President of the nine-member board, and Abel Guillén, who represents Area 7, was elected Vice President. Dr. José M. Ortiz, Chancellor of the District, was elected Board Secretary. Meredith Brown, elected in November to represent Area 2, was sworn-in by Peralta Trustee Linda Handy. Nicky González Yuen, who represents Area 4, and Cy Gulassa were sworn-in by State Assembly Member Nancy Skinner. 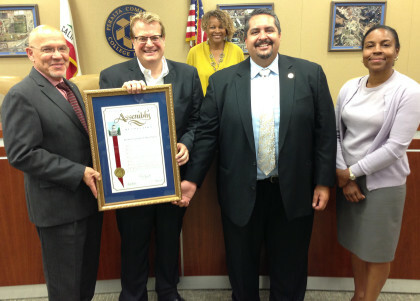 Bill Withrow, who represents Area 1, was sworn-in by Joseph Bielanski, a member of the Board of Governors of the California Community Colleges and also the Institutional Effectiveness Coordinator at the Peralta Community College District. Student Trustees serving on the Board are Sharon Clegg and Brian Cervantes. A graduate of UC Berkeley with a M.A. in English, Cy Gulassa has taught at institutions such as Frostburg State University in Maryland and the Philadelphia College of Art, as well as teaching English at De Anza College for 30 years. He served as president of the Foothill-De Anza District Faculty Association for fifteen years and founded the Bay Faculty Association. He lectures on community college reform and governance issues and has published over 150 articles. In 1994, Gulassa was named Faculty Member of the Year and was honored by State Assembly and Senate resolutions and a commendation from President Clinton. Abel Guillén is vice president of Caldwell Flores Winters Inc., where he has advised on the issuance of $2 billion in general obligation bonds for schools and colleges throughout California. In 2000, Guillén was a policy analyst for the Gore/Lieberman campaign. He has also been a research associate for the United States Department of the Treasury’s Community Development Financial Institutions Fund in Washington, D.C., and in the 1990s Guillén was in the Coro Fellows Program in Public Affairs and a Jesse M. Unruh Assembly Fellow. The first in his family to attend college, he has a Masters Degree in Public Policy and Management from the Goldman School of Public Policy at UC Berkeley and a B.A. in Sociology, also from UC Berkeley. Meredith Brown has over 20 years of experience in complex litigation and representing public agencies. From 1989 to 1994 she practiced construction and business litigation on behalf of nationally recognized public and private clients with an Oakland law firm. From 1994 to 1999, Brown worked for a major San Francisco law firm representing a number of large and small public entities in the San Francisco Bay Area. In 2000, Brown established her own law firm, where she has continued to represent public and private clients She received her Bachelor of Science from Cornell University in 1983 and was a member of the Quill and Dagger Honorary Society. Brown received her Juris Doctor Degree from Boston University School of Law in 1988. She served as a clerk for United States Magistrate Joyce London Alexander, First Circuit in Boston, Massachusetts in 1988. Brown’s community involvement includes service as a delegate to the 2008 Democratic National Convention, President of the Alameda County Democratic Lawyers Club, Vice President and past President of the Montclair Soccer Club, past Executive Board Member of the National Women Political Caucus – Alameda County North and a volunteer Judge Pro Tem for Alameda County.